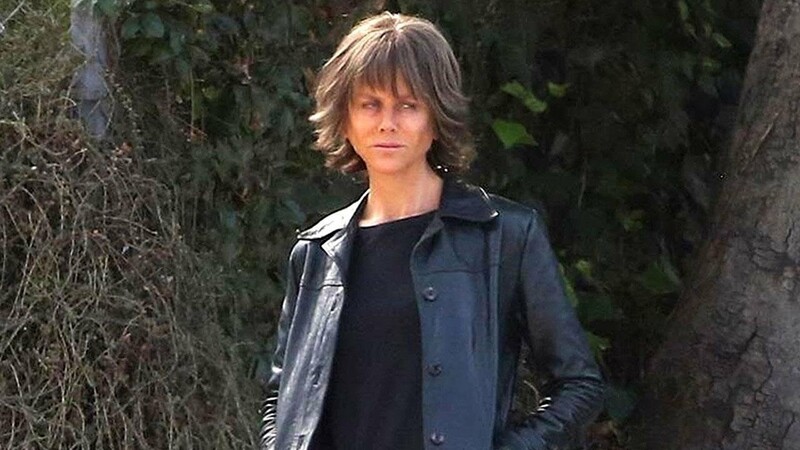 DESTROYER, Karyn Kusama’s latest film, sets its sights on the long history of grizzled cop dramas. Never one to fall prey to the expected, Kusama’s take stars Nicole Kidman as a flawed detective who struggles with a traumatic past and a strained relationship with her daughter. The film played this year’s Fantastic Fest, which should hint at the fact that there are some upcoming twists and turns in store for the audience. At the festival, Kusama sat down with RUE MORGUE, along with the film’s two writers and frequent collaborators Phil Hay and Matt Manfredi, to discuss their new film. Where did the idea for DESTROYER come from? Matt Manfredi: Like a lot of the scripts that Phil and I write, we marinate on the idea for a long, long time. Manfredi: This one we started talking about ten years ago. Phil Hay: Yeah, it was ten years ago. Manfredi: We had this idea for a cop movie with the structure you have seen. It was complicated enough that it took a bit of tinkering, and going back and forth, and thinking about. We would pick it up, put it down, come back to it, over the course of other projects we were working on. Then we hit on the character of Erin Bell. That clarified it for us. That’s when we felt that we could sit down and write it. Hay: At that moment, the three of us said “ok, let’s approach this as a movie we want to make.” It really was about finding that character. How does the process of writing work between the three of you? Hay: Matt and I cook on it for a long time. Then–we were really hopeful Karyn would be interested–we talk to her about the general idea. About the general world. In this case, we started talking about the character. Hay: Karyn would see some stuff while we were writing. Manfredi: In this case, Karyn was instrumental in figuring out who this character was. That she had to be a woman. That she had to be this specific woman. Before we really started writing we walked Karyn through the story. We wanted her to know, from the beginning, the ins and outs, and also to get her thoughts. She had some adjustments and ideas. While we were writing, Karyn was immediately in the visual process. Karyn Kusama: I collect a lot of visual material before I start actually directing. In this case, from the story that they were outlining, I had a sense of the visual. I knew the direction I wanted to take the landscape and language. As you guys write, we collectively listen to quite a bit of music that drives the creative process. Once I see a script, we start talking through, scene to scene, transitions and sequences. At that point, when we get to a place where we are happy with where the story is, we share the script with our composer (Theodore Shapiro), who I’ve worked with in nearly all my films. He actually starts writing the score before we even start shooting. A lot of tonal elements start getting clarified, even if we aren’t sure who is going to be in it, or how much money we have. Hay: We see the images Karyn is starting to put together as she is writing, and that is inspiring. What music did you listen to while making DESTROYER? Manfredi: We all share a love for Godspeed You! Black Emperor, and their many side projects. My particular favorite is A Silver Mt. Zion. Hay: It is dramatic instrumentals. Very epic. Doesn’t that make you stare dramatically out the window while you should be writing? Hay: A lot of that. Matt and I share an office. We’ll be sitting at our respective desks with headphones on. We are each in our own little music world. But specifically for this, Karyn and I went to a Godspeed You! Black Emperor show in San Pedro. It was incredible, and right when we were launching into writing this script. Kusama: It was very inspiring. Hay: The mental landscape of this character somehow was connecting. Kusama: That band is fucked up. For me, it helps me feel a relentlessness. There is something about the salt of it. It felt very true to some things about the movie. Manfredi: They have some instrumental stuff that is incredible. You mentioned it was important that the main character is female. Why? Hay: What we didn’t want to do is just swap out a woman for a man, in a cliche detective role. We were aiming for someone who was wholly rounded. Manfredi: And then hopefully the energy of the movie would be a female energy. It would be questioning the specific “maleness” of that story. Kusama: Well, also the idea of what happens to any of us when we have a badge or a uniform or a title, that assigns us a certain amount of power. Inevitably that power then gets abused. No matter how much we want to see ourselves on the right side of the law, a lot of the stories we see in movies are about the transgression of power. We wanted to also explore what that is like for an audience to see, though a female perspective and experience. It gives us a window into the flaws of power itself. How much did Nicole bring to the role of Erin? Was most of what we see on screen already on the pages of the script? Kusama: She is so refreshing. She never says, “ok, I got it,” She’s really fascinating that way. She is very open to what she doesn’t get. She was really good at asking you guys [Hay and Manfredi] questions about the character that would inform a sense of personal history. It doesn’t necessarily end up being explicit in the film. What was really interesting about her is that she immediately wanted to talk about the concepts of shame and regret, and how that informs the character. I was excited to work with her because she brought some things to the table that I hadn’t considered. It’s very easy to be thinking about rage and and wrath, and while those were things she wanted to explore, the place from which she explored it was a much more damaged, self-blaming place. That perspective helped me so much. Was there ever a version of Erin that was less dimensional? Or do female characters have an extra obligation to “have it all”? Manfredi: I think it is really important. There is something inherent in the character and the story, all of these questions that are being asked because she is a woman, or asked in a different way because she is a woman. There are many times in this genre where the male cop is an outsider, or a maverick, and he is misunderstood by people. Manfredi: That means such a different thing when that person is a woman. She is being shoved out and complained about. Not fitting in, being questioned all the time. That question has so much more to it. There is such a societal transgression to being a “bad mother.” It is such a different level than the bad father. That is a trope that is sort of accepted as the “cost of doing business.” We wanted to interrogate that. Kusama: It’s interesting that you say we can have a one-dimensional character who is male, and we accept that. We’ve come to understand that we don’t accept it. The world suffers when you see one-dimensional men and women. We are more interested in pushing outside of that idea. To see what happens if you do allow for a sense of humor, or some tenderness, or some complications that make a person seem human, as opposed to a trope.